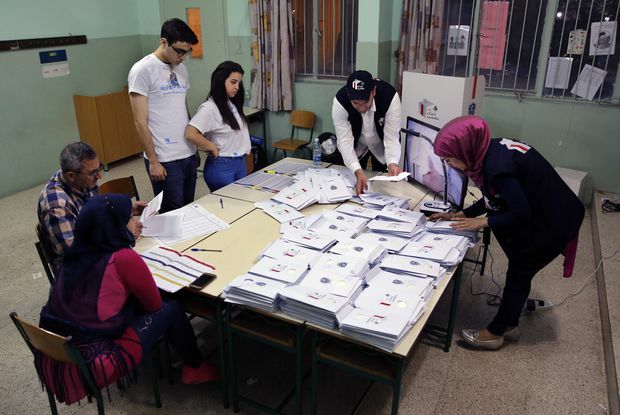 Election officials count ballots Sunday shortly after polling stations closed in Beirut, Lebanon. At the same time, independent parties and female candidates had high hopes they could put even a crack in the wall of the political dynasties that have ruled the small, crisis-prone country for decades. The election was a long-awaited exercise in democracy in one of the world’s few Arab democracies and comes at a time when Lebanon, once again, lies close to the centre of regional conflict that threatens to drag it into another war that its citizens do not want. The Lebanese hope that a stable government driven by consensus and capable of implementing enough reforms to revive the ailing economy, would make the country strong enough to insulate itself from destabilizing internal and external tensions. Early Monday morning local time, Interior Minister Nohad Machnouk said the official results would be announced at dawn, Lebanon time. However, according to preliminary results cited by politicians and Lebanese media, Hezbollah and its political allies looked set to win more than half the seats. The unofficial results also indicated that Western-backed Prime Minister Saad Hariri would emerge as the Sunni leader with the biggest bloc in the 128-seat parliament, making him the frontrunner to form the next government, though he lost seats. Lebanon’s prime minister must be a Sunni, according to the country’s sectarian power-sharing system. Even before the final results were known, the election was being hailed as a democratic success that produced a number of encouraging milestones. Other than being the first parliamentary election since 2009, it is the first election since the start of the Syrian civil war; the first to allow Lebanese expatriates to vote; and the first under a new voting law that replaced the winner-take-all poll with a proportional-voting system. The new law theoretically makes it easier for small parties and independent candidates to claim a chunk of parliamentary real estate at the expense of the established parties, some of which are still run by the old warlords, or their sons, from the 1975-1990 civil war. It is also the first election where social media came on strong and the first in which women played a prominent role. Of the nearly 600 candidates in the race, 84 were women, up from a mere dozen in 2009 (the outgoing parliament has only four female members). Lebanon’s economy has been shattered by the seven-year civil war in Syria, its biggest trading partner, and a refugee crisis that has seen Lebanon reluctantly absorb 1.5 million Syrians. Last year, the country repelled attacks from Islamic State fighters and now fears that Israeli bombing raids on alleged Iranian targets in Syria could trigger a conflict that would renew the 2006 battles between Israel and Hezbollah on Lebanon’s southern frontier. Any electoral gains by Hezbollah and its Shiite allies in the 128-seat parliament might well come with a corresponding fall in the number seats held by Mr. Hariri’s Future Movement, the main Sunni party. The Future Movement is supported by Saudi Arabia, which has been trying to move Mr. Hariri solidly into its orbit. Last November, Saudi Crown Prince Mohammed Bin Salman summoned Mr. Hariri to Riyadh, where, under pressure, he resigned for the apparent sin of having accommodated Hezbollah. Shortly after his return to Beirut, where he received a hero’s welcome, Mr. Hariri reversed his resignation. A stronger Hezbollah-led Shiite bloc would not sit well with the American, Saudi and Israeli governments, among others, which consider Hezbollah a terrorist organization that is doing Iran’s bidding in Lebanon and Syria. On Sunday, at a polling station in Beirut 2, the west Beirut voting district that is the country’s single biggest, younger voters seemed to be out in force in the late afternoon even if the older generations were not. The voter turnout was 49.2 per cent, according to the Interior Ministry, slightly less than the figure in 2009. Several young Muslim Americans, members of a religious charity called the Association of Islamic Charitable Projects, made the trek from the United States so they could vote in the election. One was Farah Karakira, 24, of Philadelphia, who was born in Los Angeles of Lebanese parents and works in a Home Depot. “I didn’t even vote in America, but I am voting here because it’s important,” she said, revealing that she voted for a Sunni candidate.